For The Fourth Straight Election, Races For The State House Attracted More Money Than The Election Before. The 2018 Races Drew About $27.6 Million Overall, According To MCFN’s Tracking. LANSING (March 28, 2019) — There are 110 seats in the Michigan House. But only one came with a price tag of $1.5 million. Democrats, Republicans and a laundry list of Lansing-based interest groups poured that amount of money into the 61st District outside of Kalamazoo last year. Their total spending amounted to $32 per vote that was cast. 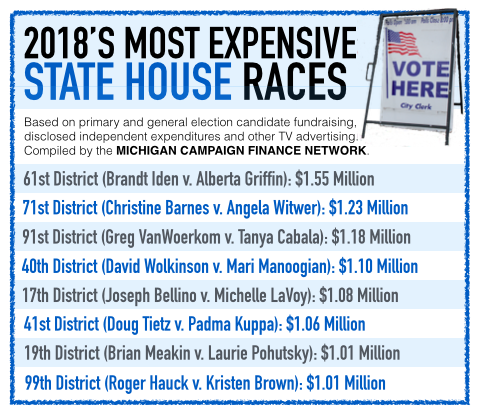 In the end, the race could be the most expensive state House contest in Michigan history with Rep. Brandt Iden narrowly winning re-election over Democrat Alberta Griffin. The 61st District campaign is the most dramatic example of 2018's pricey fight for control of the Michigan House. Despite there being races for the state Senate and an expensive gubernatorial contest also on the ballot, the 2018 state House races still attracted a record $27.6 million. The total came from the Michigan Campaign Finance Network’s analysis of primary and general election candidate fundraising disclosures, independent-spending reports, broadcast TV ad-tracking data from Kantar Media/CMAG and TV ad filings from the Federal Communications Commission. The 2018 total of $27.6 million is up slightly over the 2016 total of $27.0 million. However, in 2016, the state House contests didn’t have to compete for attention and funding with races for governor and the state Senate. Michigan elects state House members every two years. There are 110 seats in the House. Each member represents about 90,000 people. For four straight elections, the overall amount of money that MCFN tracked in the state House races increased. The money isn’t spread evenly over the 110 districts. Funders, political parties and interest groups focus heavily on 10 to 15 of the most competitive districts, districts where Republicans and Democrats both hope to win. Those 10 to 15 districts decide whether Republicans or Democrats have a majority, meaning they get to set the agenda in the House. In 2018, there were only 15 general election state House races in which the Democratic and Republican candidates finished within 10 percentage points. Republicans won 58 of the 110 seats in 2018 while Democrats won 52. Of the $27.6 million overall total, about $11.1 million — or 40 percent of the money — went to just 10 of the 110 races. Of those 10 most expensive races, Republicans had a financial advantage in six. For the 2018 election cycle, candidates running for the Michigan House could receive up to $1,000 in contributions directly from an individual or up to $10,000 from a political action committee (PAC). However, about $10.7 million — or 39 percent of the tracked money in the 2018 state House races — flowed through sources with less strict contribution limits. The House Republican Campaign Committee and the House Democratic Fund are the official caucus committees of the House Republicans and House Democrats. They could accept up to $40,000 per year from a donor. The House Republican Campaign Committee reported $3.4 million in expenditures to directly influence state House races in 2018. The House Democratic Fund reported $1.7 million in expenditures to directly influence state House races. The House Republican Campaign Committee’s top donors over 2017 and 2018 were members of West Michigan’s DeVos family, who gave $440,000, members of the Kennedy family, who lead Autocam and gave $160,000, and members of West Michigan’s Secchia family, who gave $120,000. The House Democratic Fund’s top donors included the Michigan Democratic State Central Committee, which gave $135,000, the United Auto Workers Michigan Voluntary PAC, which gave $80,000, and the Michigan Education Association PAC, which gave $80,000. 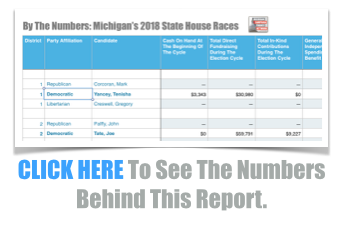 On top of the caucus committees, the Michigan Republican Party and the Michigan Democratic Party were both heavily involved in the state House races and can raise unlimited amounts from donors. 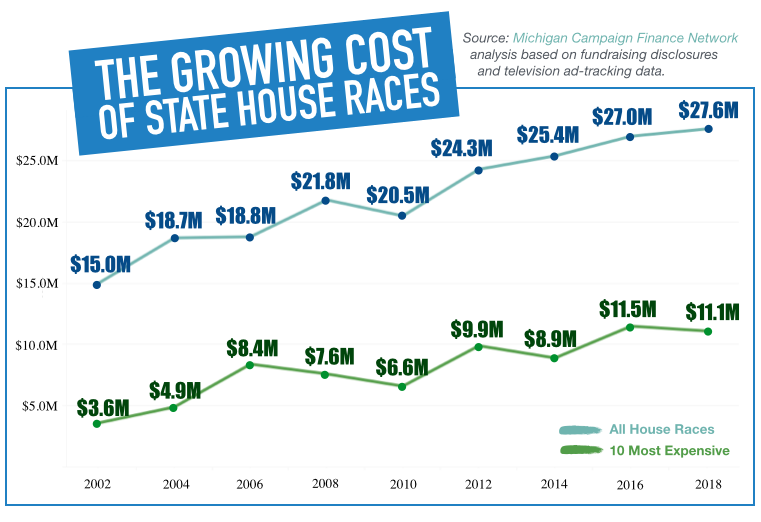 The Michigan GOP spent an estimated $1.0 million on TV ads that either promoted or criticized House candidates and reported spending $723,335 on independent expenditures in state House races. 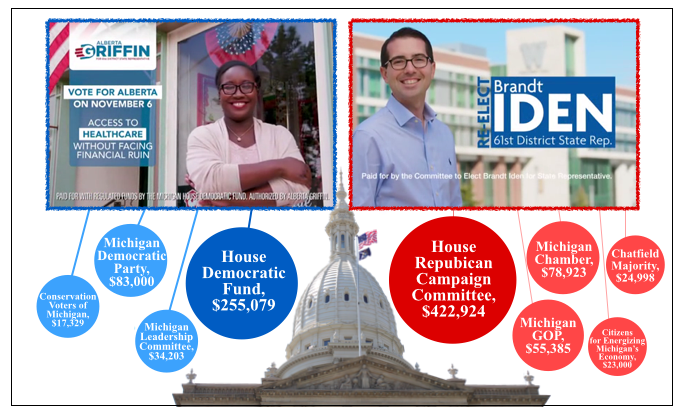 The Michigan Democratic State Central Committee spent an estimated $1.4 million on TV ads that either promoted or criticized House candidates. Other groups acting outside of the candidates’ campaigns can also raise unlimited amounts from donors. And sometimes, those donors don’t have to be disclosed. One TV advertiser was the nonprofit organization Citizens for Energizing Michigan’s Economy, which is connected to Consumers Energy. The group spent an estimated $400,000 on TV ads promoting state House candidates in either the primary or general elections. In the House races, the group most heavily backed Democrat Sarah Schulz, who was running against Republican Annette Glenn in the Midland-area 98th District. Glenn is married to former state Rep. Gary Glenn, who had been a vocal critic of the state’s dominant electric utilities. Citizens for Energizing Michigan’s Economy spent an estimated $184,000 on broadcast TV ads touting Schulz, who lost, according to MCFN's analysis. Other active outside spenders in the state House races were the Michigan Chamber of Commerce’s super PAC, which spent about $307,000, and the Michigan Leadership Committee, which was funded by the national Democratic Legislative Campaign Committee and spent about $1.0 million. Two PACs funded primarily by members of the DeVos family, the Michigan Freedom Network and the Great Lakes Education Project (GLEP), combined to spend about $171,441 on independent expenditures in House races. The Michigan Freedom Network and GLEP did much of their spending in the primary elections. 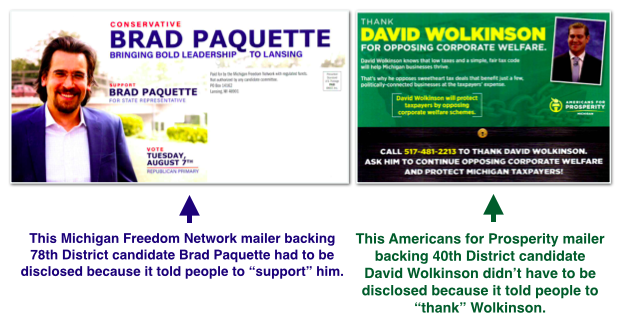 GLEP spent about $17,549 in support Republican Brad Paquette of Berrien Springs in the 78th District, and the Michigan Freedom Network spent about $30,711 to boost Republican Mike Mueller of Linden in the 51st District. Both Paquette and Mueller won and are now House members. When it comes to dark money, political spending that can’t be tracked back to the original source, MCFN discovered at least $3.2 million in dark money — or about 11 percent of all the money in the House races. The $3.2 million total was spending on TV ads that didn’t have to be disclosed at all or in spending by groups that were primarily funded by entities that don’t disclose their donors anywhere. MCFN can’t track unreported spending on things like mail pieces and digital ads that don’t expressly tell viewers which candidate to support or oppose. Many of the groups mentioned above were involved in the expensive 61st District race, which attracted about $1.5 million overall. About 45 percent of the money in the race came from either the House Republican Campaign Committee or the House Democratic Fund, which sponsored TV ads and mailers backing their candidates. The House Republican Campaign Committee reported spending about $422,924 in support of Iden, who was then-chair of the House Regulatory Reform Committee. The House Democratic Fund spent about $255,079 in support of Griffin. In addition to that money, there was about $223,219 in disclosed independent spending in the race. Among the groups backing Iden were the Michigan Chamber of Commerce’s super PAC, which spent $78,923, the Michigan Republican Party, which spent $34,385, and the Chatfield Majority Fund, the PAC of Republican House Speaker Lee Chatfield, which spent $24,998. 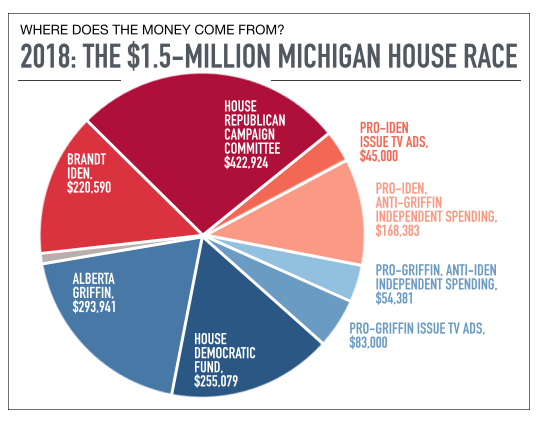 Among the groups backing Griffin were the Michigan Leadership Committee, which spent $34,203, and the Conservation Voters of Michigan, which spent $17,329.